These are a couple pictures of my pal, Clyde. He's my 4.5 pound, 16 year old Pomeranian. This is a picture that I took after we were finished with a canoeing adventure on the Brandywine. 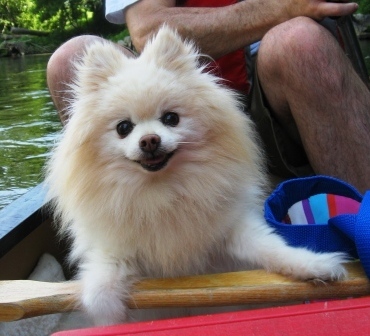 He went canoeing with Candace, Dave, and I last summer (late June). He looks so happy in this shot. He looks so funny in this shot because his backside is still wet, while his mane area had finished drying. He's also a little upset with me, because I put him on a big boulder (about 2 feet off the ground) to keep him out of the way until the canoes were on the truck and he was out of danger. I know, 2 feet up? But yes, that's enough to keep him put. He is no longer able to jump down from "high" places. And yes, 2 feet is now high for him - because of some arthritis in his limbs. He is the cutest little guy. And so loveable. And such a wimp. But I love him all the same. Today it's supposed to be a record high -- nearly 70 F. So, this picture of Clyde, and some of the other fun pictures from that day, reminds me that this chill will soon be over with and I'll be able to go outside, in the woods, streams, mountains without freezing. I got my swap today! Yay:) I can't wait for round 2.